by Anna Brindley in Use your Noodle! When I lived in Astoria Queens for a short stint, there was this chinese restaurant that had the most amazing shrimp lomein. I would order it every time I went. When I was at a Spec’s store in Temple TX the other day where I pick up my Udon noodles of all things, I noticed that they had Lomein noodles! Ha, I thought—there is my next quest! This recipe is a work in process but I had to borrow from a few to make my own. I will try to improve upon this but I have to say, if I made it like this every time, I would still crave it. I just want to get more creative with the veggies for next few iterations. 1/2 lb. of shrimp cut up into pieces, peeled of course.. Boil the lomein noodles but remove just before being all the way done…al dente style. Saute ginger in canola or peanut oil and let the kitchen get all gingery! Then add shrimp until they turn pink. Remove. Add a little more oil and saute red bell pepper and garlic. Once it starts to soften, add sugar snap peas and enjoy the beautiful colors as they swirl with your wooden spoon. 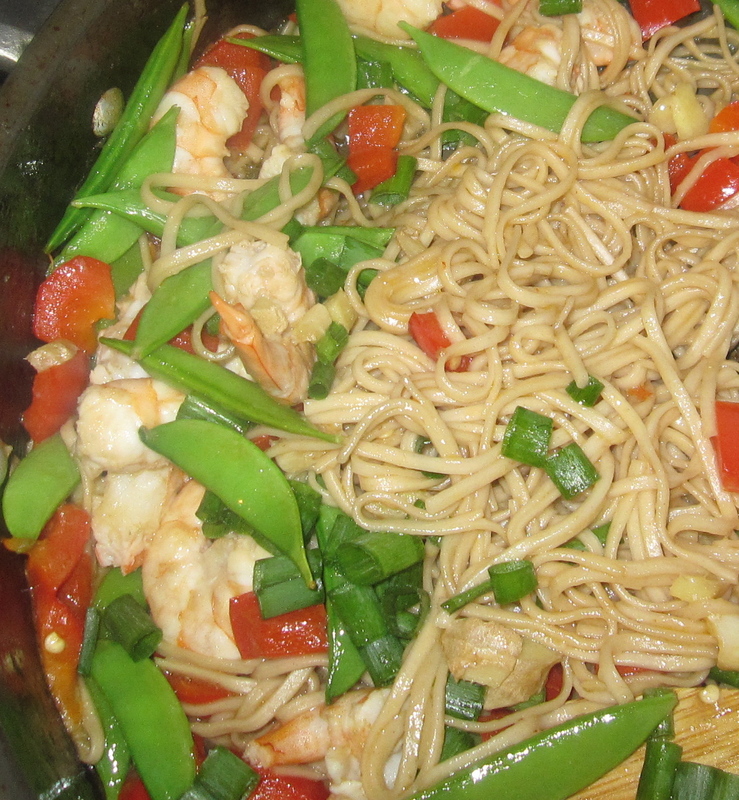 Add the lomein noodles in with the vegetables and pour in the soy/oyster/stock/oil mixture. Let noodles absorb the liquid. Add the shrimp and ginger back to the pan and stir in. Cut some green onions/scallions with some scissors over the dish before serving. My love affair with paella started when I lived in NYC. After having the he best paella I have ever had is in Bayonne NJ, I became obsessed. I kept trying different restaurants over and over trying to find some as good as what I had in NJ. Even when I was in Spain, I found it hard to find a dish as good as the one in the Spanish restaurant in NJ. My quest did lead me to my second favorite version of paella– in Amsterdam.. This recipe is closest to the Amsterdam paella that I had several years back. After several attempts and various recipes. I settled on this one. It is very much a comfort food dish! -Sprinkle smoked paprika on chicken thighs. Sprinkle lightly for a touch of smokiness and coat somewhat generously for more smokey flavor, let sit for an hour at least before browning. -Brown chicken thighs, skin side down first in canola or olive oil. Brown each side. Remove from pan. -Saute 2 chopped onions, 2 red bell peppers cut into strips, and garlic smashed and chopped until softened. -Place browned chicken on top of sauteed vegetables. -Add paella or short grain rice place around the chicken (not on top of chicken) but on top of veggies. Try to get each grain to touch the oil. -Lightly toast the saffron and add it to the warmed chicken stock. -Add stock a little as you go. Use about 16 oz first. Once it appears to be absorbed, add the additional stock. You may not need all of the stock but you will probably use most of it, if not all. -Once the rice starts cooking, add the kielbasa. I like the sausage cut at an angle in about 1 inch increments. NOTE: I rotate my paella pan because I cook it in the paella pan over 2 gas burners. With my sister, we cooked it over 2 burners too on your glass top stove. Traditionally, paella is cooked over open flames much like an outdoor grill. This method works indoors if you don’t have the fancy 6 burner stove where each burner is side by side. Let cook (while rotating, if necessary) for about 1 hour. -The carmelizaation on the sides and bottom of the pan that happens is what to strive for. -DO NOT stir this dish while it is cooking with the rice. About 15 minutes before it is done, add frozen peas on top and lightly press into the rice. This came in an email to me and some friends from my sister. Okay– this one is so good and so easy, I thought I would share with everyone! Serve warm with with tortilla chips! YUM!! I bet someone will ask for the complicated recipe!! Need ideas for your Christmas celebrations? My sister rocks at this. This is her list. Did I mention she trained at the French Culinary Institute? My girl knows food!. I would love your comments for ideas. For some reason, my mind always goes blank when I try to think of things to serve. Gratefully, I can easily refer to this list now! –Sushi (only veggie or California rolls– don’t want seafood sitting out)—- always a hit! –Deviled eggs– a must. For those who are on a low carb diet (Fun twist– cut eggs in half at the fat part, not the length. You may want to cut a little off the bottom, so the don’t slide on plate. Makes them look more elegant to me!) Top with caviar on some if you like. -Dates with bacon—– VERY easy and good. Dates (seedless) dried. Wrap with bacon– bake until bacon is done. –Champagne drinks– Royal Kir with fresh berries or I like to use frozen (keeps drink cold) — put Chambord in with frozen berries, put into bottom of wine glass, then pour champagne. Do you love to sample new products in grocery stores? I admit, I just love it. It’s fun and FREE! For a host of reasons, I get really excited about local products—not just with food but for nearly everything. So when I asked “Mary” if this enchilada sauce I was about to try was local, she said “yes, we are based in Fort Worth”. I said, “Oh, so this is your sauce?”. Yes, she said. Our conversation continued about her launch of a new product and getting into stores. As she is talking — I am thinking about how I have to convince her to come and speak at a Think Tank Society meeting…. as I WATCH her magically take a corn tortilla, whip it around in some sauce, and roll it with cheese and onions into this amazing looking and SMELLING snack that I am about to sink my chompers into. It left me spinning. The sauce is amazing. I don’t use that term lightly and I really don’t want to do reviews of products unless they are stellar. As Mary told me, this is restaurant quality available at the supermarket. Truly, the sauce is BETTER than even some of the great Tex-Mex restaurants around here. If you need a little help using her sauce, she has instructional videos on her site. Talk about a value add! Enchiladas Ole is available in Central Market and Whole Foods….. and coming soon to everywhere else. Not only is Mary a rockstar in the kitchen she’s got some business savvy too. Watch out world! 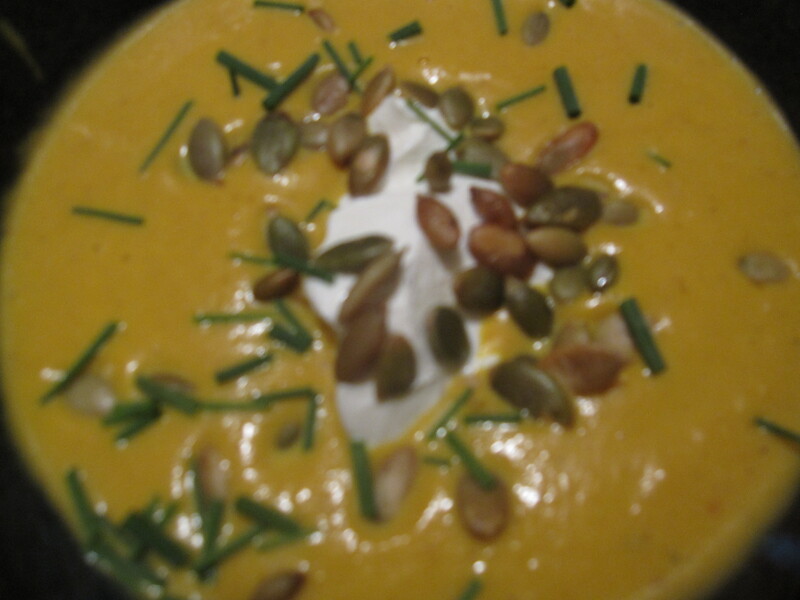 The crunch of the pumpkin seeds, the contrast of hot soup with a dollop of cool sour cream covers all of the sensational bases! Find it in Colorado Colore page 64. Combine 2 TBS of Salt with warm water in a large bowl (large enough to hold chicken wings). After salt dissolves, add chicken. Add cold water to cover the chicken and top off with ice. Refrigerate at least 4 hours or overnight. Preheat oven to 425 degrees. Drain chicken and pat dry. Place salt and flour in brown or plastic bag. Place a few wings in at a time to coat. Shake off excess flour. Repeat with all pieces. Put butter on a sheet pan and put into oven until it melts. Place chicken skin side down onto the pan with melted butter. Cook up to 40 minutes. Flip and bake for about another 20 minutes (based on wing size). Once chicken is done, take out and douse into the Buffalo Sauce mixture. Mix all ingredients and taste—adjust accoringly.